London, April 1917—Gabriel Ilyas Ward was discharged from the military hospital where he received treatment for exposure to nerve gas, an occupational hazard of his year-long deployment to France. Ward descended into the streets of London in search of a decent café. He did not know this town at all; a Syrian Christian from Mount Lebanon, Ward was a former Ottoman national who had lived in the United States since the 1890s. In America he obtained U.S. citizenship and served in the military twice, in both the Philippines and Cuba. 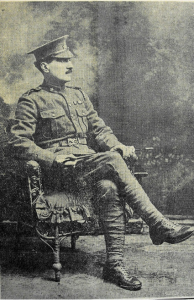 With the Ottoman Empire’s entry into World War I late in 1914, Ward once again tried to enlist with the US Army, and when his request was denied, he joined a Canadian regiment of the British Army and was deployed to France. Before combat took his eye in 1917, Ward had seen the worst of the Western Front: trenches, gas attacks, and hunger, which punctuated months of drab and listless monotony. During those monotonous times, Ward penned letters home to New York, to a friend who printed them in al-Huda, one of the Syrian diaspora’s most widely circulated newspapers. Figure 1: Gabriel Ward after his return from Europe, c. 1919. He was seated in profile to disguise the loss of one eye as a result of his exposure to nerve gas at the Western Front. Source: Arab American National Museum, Dearborn, Michigan. Between 1916 and 1918, Gabriel Ward became the Syrian diaspora’s first war correspondent, and his serial columns about his “hajj to break the German Empire” circulated among syndicated Syrian papers printed in the United States, Brazil, and Argentina. This post deals with a single one of Ward’s letters from Europe, about his release from a London hospital and an unlikely meeting in [where else] a local Syrian coffee shop. In the Syrian diaspora, men’s cafés provided an important space for the discussion of Syrian politics, and Ward’s descriptions of debates held over cups of strong coffee provide historians with a micro-historical perspective into the political milieu of the time. As a socially-produced transnational archive, the Syrian press is a rich historical source for historians of World War I precisely because it captures small stories within their immediate intellectual and political context. Ward’s letters to New York were unencumbered by the imposed certainty and nationalist politics that dominate personal accounts written after 1918. Like other written records, newspapers cannot be used as accurate event-driven reporting of the war itself; they can, however, deliver a rich and deeply local perspective into how individual Syrians experienced political mobilization against the Ottoman state. As shall be seen, this was a time when new political categories emerged, particularly those linked to “the nation.” But while present, ideas about the nation remained very much in flux, in constant conversation with confessional identities, and had not hardened into “nationalisms” in service to the project of state-making which came only after the 1919. In his April 1917 letter to al-Huda, Ward reported leaving the military hospital overcome with an uncharacteristic homesickness that compelled him to seek out London’s Syrian Quarter. There, he discovered a Syrian café known as a haunt for expatriate Syrian soldiers. Ward was joined by two companions from his regiment, and upon receiving their coffee the men discussed the war’s events in their homeland in Mount Lebanon: forced conscriptions, famine, hangings, and the mundane brutalities of military rule. As they read and discussed accounts of Mount Lebanon’s devastation from copies of Syrian newspapers they found in the café, Ward had not noticed that their host, the café owner Muhammad al-Saʿid [Ward reports he was an Egyptian Muslim from Cairo], had listened intently to their conversation and was keen to engage the trio of soldiers on the subject of war. The café owner sucked through his teeth, “God curse the Unionists… they have neither religion nor Islam, because no Muslim starves or hangs his people.” Conceding that Muslims in the Arab Provinces were for a time “deluded by the Turks” and by the Ottoman government’s call for jihad, “now there must be no faction between us—Muslim and Christian—because all of us are Arabs, humiliated and enslaved.” The coffeemaker identified himself with Emir Faysal’s Arab Revolt, which had been for some months pushing its way into southern Syria with British military support. al-Saʿid wished to inquire whether Syrian and Lebanese emigrant troops fighting for the Entente had the same goals and interests as the Hashimite revolutionaries. 1917 was a time of intense mobilization for Syrians disenchanted with Ottoman rule, especially among the one-in-six Ottoman Syrians living in the diaspora. As Faysal’s troops made slow progress towards Damascus, pro-Hashimite secret political committees sprang up in major Syrian cities to clear the ground for a general uprising against Cemal Pasha’s Ottoman government. These groups, furthermore, depended on transnational political networks that extended beyond Ottoman Syria, linking émigré activists in Egypt, Brazil, and the United States to funnel money, materiel, and even manpower back to the Hashimite cause. At the same moment, prominent emigrant leaders led recruitment campaigns targeting young Syrian and Lebanese men, urging them to join the French, British, and American militaries for the sake of liberating the homeland. Which homeland these men would save remained inchoate and unclear, however; in the ambiguities and possibilities of total war, Syrian, Lebanese, and Arab nationalisms were less ideological, more fluid, and more completely situational than would be the case in the decade to come. And this ambiguity is the key to understanding the discussion between Gabriel Ward, Syrian-American war correspondent, and Muhammad al-Saʿid, coffeemaker. Figure 2: Executive Committee of Jamʿiyyat al-Nahda al-Lubnaniyya shortly before the War, 1913. Naʿum Mukarzil seated, second from right. Source: Sallum Mukarzil, al-Kitab al-Lubnani: li-tadhakar Yubil al-Nahda al-Lubnaniyya al-Fuddi (New York: Matbaʿat al-Huda, 1937). As if by chance, al-Saʿid asked Ward, “Do you know the editor of al-Huda? Are you a member of Jamʿiyyat al-Nahda al-Lubnaniyya [Lebanon League of Progress]?” Ward not only wrote for al-Huda, but he knew its editor, Naʿum Mukarzil, intimately. Mukarzil had long been one of the Syrian diaspora’s most controversial (and at times divisive) political figures. A founding member of the Decentralization Party, Mukarzil was among the earliest to advocate for French tutelage over Mount Lebanon and for the creation of a greater Lebanese state. His newspaper was one of the most widely circulated in the Syrian diaspora; Mukarzil’s detractors whispered that it was French subsidies that boosted al-Huda’s profile. In 1916 and 1917, Mukarzil had devoted much of his time in New York City, lobbying for Syrian and Lebanese emigrants to enlist in the armed forces, first in the French infantry and after 1917, in the U.S. Army. But while Mukarzil enjoyed moderate success in contracting recruits for immediate deployment to France, many Syrians saw his campaign as a worrying sign of imperialist collaboration dressed as patriotic politics. Those who distrusted French involvement in the Levant grew concerned that Mukarzil’s recruits would be used not to liberate the homeland, but to occupy it instead. And no party felt this fear more acutely than did the Arab nationalists, represented here by Muhammad al-Saʿid. This single conversation, which occurred in a Syrian café in London, illustrates some of the central political tensions of the time and their expression at the micro-level between individuals in a mundane space. First, that such a conversation could have occurred at all demonstrates the political connectivities of the Syrian diaspora at this moment. al-Saʿid’s café was stocked with Syrian newspapers from abroad, including al-Huda, which regularly reported on the al-Nahda al-Lubnaniyya’s recruitment campaigns in New York City. The café owner was familiar enough with its political inclinations to engage Ward (an al-Huda correspondent) in debate about them. Second, Ward’s and al-Saʿid’s reported agreement that military mobilization against the Ottoman state was the preferred means of liberating Syria underlines Ward’s desire to uncover shared interests between the émigré recruitment campaign and Faysal’s Arab Revolt. Soon after the war, the al-Nahda al-Lubnaniyya would become vociferously anti-Hashimite and pro-French Mandate, but during the mobilization of 1917, the nationalist leanings of the former were murkier, more ambiguous. Finally, the discussion between al-Saʿid and Gabriel Ward touches on the strange position of emigrant troops between the imperialist powers of the Entente. Were Syrian emigrants like Ward who fought alongside the British or French struggling for the sake of their homeland, or were they arms of a coming imperial power? al-Saʿid’s anxiety about national and sectarian identities [as Syrian, Lebanese, Christian, etc.] belied his fear that the Entente would exploit divisions among Syrian Ottoman subjects and use these colonial troops as a means of accomplishing that. al-Saʿid’s plea for Arabism was less a nationalist one than a repudiation of the divisive logic of alternatives being floated in the press at the time. Ward’s discussion with al-Saʿid was, in the end, a very small part of a small story about a single Syrian emigrant’s deployment in the British military. But the experience of pro-Entente mobilization, deployment of Syrian émigré troops, and their use by Syrian, Lebanese, and Arab nationalist parties to leverage competing political claims with the Allied Powers was a defining aspect of the Syrian diaspora’s experience of World War I. Many Syrian American newspapers are accessible at Washington DC repositories for interested researchers. While the Syrian press at home found itself stymied by Ottoman censorship policies, most of the diaspora’s titles continued production uninhibited through the War years. As such, they remain a vast [and significantly untapped] archive of transnational political life between Syria and its communities abroad. At the Library of Congress, runs of al-Bayan, al-Huda, Mirat al-Gharb, al-ʿAlam al-Jadid, al-Majalla al-Tijariyya al-Suriyya al-Amrikiyya, al-Funun are available during the war years. Further information about these diasporic newspapers can be obtained by consulting Yusuf Asʿad Daghir, al-Qamus al-Sihafa al-Lubnaniyya, 1858-1974 (Beirut: al-Maktaba al-Sharqiyya, 1978), or Henri Melki, al-Sihafa al-ʿArabiyya fi-l-Mahjar wa-ʿAlaqatuha bi-l-Adab al-Mahjari (PhD Dissertation: Georgetown University, 1972). Source: Ward, Jibraʾil Ilyas. “Hadith al-Muslim,” al-Huda 11 May 1917, 5.